The United States, Canada and Mexico finally signed a new trade deal following intense negotiations. A long way lies ahead, however, before the deal could be ratified and is expected to ignite fierce debates in a split U.S. Congress. On the sidelines of the Group of 20 (G20) summit in Buenos Aires, U.S. President Donald Trump, Canadian Prime Minister Justin Trudeau and outgoing Mexican President Enrique Pena Nieto on Friday signed the U.S.-Mexico-Canada Agreement (USMCA), which will replace the 24-year-old North American Free Trade Agreement (NAFTA). "This has been a battle, and battles sometimes make great friendships," said Trump before the signing ceremony. Hailing the deal as "modern and balanced," the president said it will benefit U.S. farmers, autoworkers and bring back manufacturing jobs. "I look forward to working with members of Congress and the USMCA partners -- and I have to say it's been so well-reviewed, I don't expect to have very much of a problem -- to ensure the complete implementation of our agreement," he said. Trump's optimism, however, is not shared among some members of Congress. "In the coming months, Congress will have the opportunity to debate the details of USMCA and consider how it will impact workers and job creators in this country," Republican Senator Orrin Hatch said Friday in a statement, signaling that Congress will likely wait until next year to have a vote on the deal. House Democratic leader Nancy Pelosi, who is expected to take the role of House Speaker in January, also expressed deep concerns over the deal's enforceability. "We are waiting to see enforcement provisions relating to workers and the environment," Pelosi said Friday in a statement, reiterating her discontent with the deal. "Mexico must also pass and implement its promised labor law changes to raise the wages and working conditions of Mexican workers competing with American workers." The USMCA, which needs to be ratified by lawmakers from the three countries, requires at least 40 percent of car production to come from factories with an average wage of US$16 per hour, which can put Mexico, a low-cost production hub, at a disadvantage. In a speech delivered Thursday afternoon, Senator Elizabeth Warren, who is considered a possible Democratic contender for the 2020 presidential race, claimed that the new deal fails to address critical issues in NAFTA, adding her voice into a groundswell of opposition from Democrats. "Trump's deal won't stop the serious and ongoing harm NAFTA causes for American workers. It won't stop outsourcing, it won't raise wages, and it won't create jobs," Warren said. Meanwhile, a number of lawmakers and business groups are trying to push for the removal of U.S. tariffs on steel and aluminum imports from Canada and Mexico, which have inflicted harm upon American manufacturers and consumers, raising costs for a wide array of industries. "While there's a lot to like in this new agreement, I'm disappointed that the Section 232 tariffs on Canada and Mexico still remain in place," Republican Senator Rob Portman said in a statement on Friday. 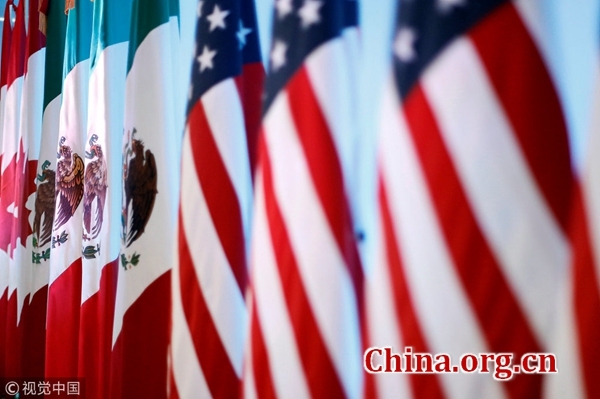 Business Roundtable, an influential association of leading U.S. companies' executives, also called for a "prompt resolution" of the tariff issue between all three countries while reviewing the final text of the new trade agreement. At the USMCA signing ceremony, Trudeau attempted to press the U.S. president on steel and aluminum tariffs. Calling the recent plant closures of General Motors in North America "a heavy blow," Trudeau said "it's all the more reason why we need to keep working to remove the tariffs on steel and aluminum between our countries." U.S. Trade Representative Robert Lighthizer said after the signing ceremony that talks to resolve the remaining steel and aluminum tariffs will continue next week. "It's something we're turning our attention to," he said. The Trump administration in June imposed a tariff of 25 percent on steel imports and a 10 percent on aluminum imports from Mexico, Canada and the European Union, citing national security concerns. After the signing by three leaders, the U.S. International Trade Commission will have up to 105 days to complete a report on the economic impact of the agreement, which could be ready by mid-March. Many lawmakers are stilling waiting to see the analysis before making a final judgment. If the USMCA goes to Congress, it will face a simple yes-or-no vote under the so-called "fast-track" law, a 2015 trade legislation, with no amendments or procedural delays allowed. However, the Democrats-controlled House can challenge that by introducing a rule to remove the deal from fast-track consideration, which could lead to a prolonged debate about possible "tweaks" of the deal. Analysts said Democrats are unlikely to reject the new deal completely, as there is no available alternative. Trump could threaten to unilaterally pull out of NAFTA if the new deal fails to get through Congress. Democratic Representative Bill Pascrell, in line to become the new chairman of the House Ways and Means Subcommittee on Trade, has said he thinks the deal still has a tough road ahead. "Trump made it seem like this was a done deal, but there is a long, long way to go," he said.